Loss of Habitat, lack of enough food in the jungle and human interference to the wildlife has started taking its toll around the world. We often hearing some disturbing news that wild animal has attacked and killed domestic animals and human too in recent days. In a similar case, A female leopard suspected to be a man-eater was shot dead in the early hours of July 12, 2018 in Motichur range of Rajaji Tiger Reserve in Uttarakhand -India an official said. Aged about 6-7 years, the female leopard was shot dead at around 3:30 am when it was spotted walking with a limp near Khand village where people displaced by the Tehri dam reside, Rajaji Tiger Reserve Director Sanatan Sonkar said. On close examination its right paw was found to be severed which made it walk with a limp, he said. 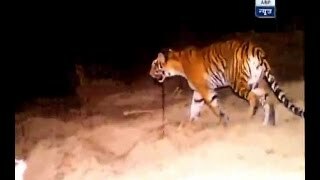 The disability may also have been the reason why the big cat had become a man-eater instead of hunting in the forests for prey, Mr Sonkar said. The Rajaji Tiger Reserve authorities have a strong suspicion that the female leopard killed today had claimed a number of victims in villages neighbouring the reserve. The order to kill the suspected man-eating leopards was issued by the then wildlife warden DVS Khati through a letter dated May 21, 2018, which also authorized Dehradun resident Prashant Singh as the hunter for the purpose, Sonkar said. We must respect our nature and natural resources then only we can be respected by nature and wildlife too. If you have more on this story, please write your comment below.